Not to be confused with Cortes Españolas or Cortes Gerais. The Cortes Generales (Spanish pronunciation: [ˈkortes xeneˈɾales], General Courts) is the legislature of Spain. It is a bicameral parliament, composed of the Congress of Deputies (the lower house) and the Senate (the upper house). The Cortes has power to enact any law and to amend the constitution. Moreover, the lower house has the power to confirm and dismiss the President of the Government (prime minister). The system of Cortes arose in the Middle Ages as part of feudalism. A "Corte" was an advisory council made up of the most powerful feudal lords closest to the king. 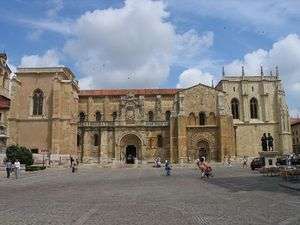 The Cortes of León was the first parliamentary body in Western Europe. From 1230, the Cortes of Leon and Castile were merged, though the Cortes' power was decreasing. Prelates, nobles and commoners remained separated in the three estates within the Cortes. The king had the ability to call and dismiss the Cortes, but, as the lords of the Cortes headed the army and controlled the purse, the King usually signed treaties with them to pass bills for war at the cost of concessions to the lords and the Cortes. Queen Maria de Molina presents her son Fernando IV in Valladolid Corts of 1295. With the reappearance of the cities near the 12th century, a new social class started to grow: people living in the cities were neither vassals (servants of feudal lords) nor nobles themselves. Furthermore, the nobles were experiencing very hard economic times due to the Reconquista; so now the bourgeoisie (Spanish burguesía, from burgo, city) had the money and thus the power. So the King started admitting representatives from the cities to the Cortes in order to get more money for the Reconquista. The frequent payoffs were the "Fueros", grants of autonomy to the cities and their inhabitants. At this time the Cortes already had the power to oppose the King's decisions, thus effectively vetoing them. In addition, some representatives (elected from the Cortes members by itself) were permanent advisors to the King, even when the Cortes were not. Isabella I of Castile and Ferdinand II of Aragon, the Catholic Monarchs, started a specific policy to diminish the power of the bourgeoisie and nobility. They greatly reduced the powers of the Cortes to the point where they simply rubberstamped the monarch's acts, and brought the nobility to their side. One of the major points of friction between the Cortes and the monarchs was the power of raising and lowering taxes. It was the only matter that the Cortes had under some direct control; when Queen Isabella wanted to fund Christopher Columbus's trip, she had a hard time battling with the bourgeoisie to get the Cortes' approval. The role of the Cortes during the Spanish Empire was mainly to rubberstamp the decisions of the ruling monarch. However, they had some power over economic and American affairs, especially taxes. The Siglo de oro, the Spanish Golden Age of arts and literature, was a dark age in Spanish politics: the Netherlands declared itself independent and started a war, while some of the last Habsburg monarchs did not rule the country, leaving this task in the hands of viceroys governing in their name, the most famous being the Count-Duke of Olivares, Philip IV's viceroy. This allowed the Cortes to become more influential, even when they did not directly oppose the King's decisions (or viceroys' decisions in the name of the King). Some lands of the Crown of Aragon (Aragon, Catalonia and Valencia) and the Kingdom of Navarre were self-governing entities until the Nueva Planta Decrees of 1707 abolished their autonomy and united Aragon with Castile in a centralised Spanish state. The abolition in the realms of Aragon was completed by 1716, whilst Navarre retained its autonomy until the 1833 territorial division of Spain. It is the only one of the Spanish territories whose current status in the Spanish state is legally linked with the old Fueros: its Statute of Autonomy specifically cites them and recognizes their special status, while also recognizing the supremacy of the Spanish Constitution. Cortes (or Corts in Catalonia and Valencia) existed in each of Aragon, Catalonia, Valencia and Navarre. It is thought that these legislatures exercised more real power over local affairs than the Castilian Cortes did. Executive councils also existed in each of these realms, which were initially tasked with overseeing the implementation of decisions made by the Cortes. However, throughout the rule of the Habsburg and Bourbon dynasties the Crown pressed for more centralization, enforcing an unitary position in foreign affairs and empowering Councils outside the control of the Cortes of the several Kingdoms. 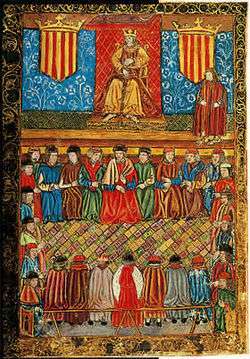 Thus, the Cortes in Spain did not develop towards a parliamentary system as in the British case, but towards the mentioned rubberstamping of royal decrees. Nevertheless, from time to time the Cortes tried to assert their control over budgetary issues, with varying grades of success. Cádiz Cortes operated as a government in exile. France under Napoleon had taken control of most of Spain during the Peninsular War after 1808. The Cortes found refuge in the fortified, coastal city of Cádiz. General Cortes were assembled in Cádiz, but since many provinces could not send representatives due to the French occupation, substitutes were chosen among the people of the city – thus the name Congress of Deputies. Liberal factions dominated the body and pushed through the Spanish Constitution of 1812. Ferdinand VII, however, tossed it aside upon his restoration in 1814 and pursued conservative policies, making the constitution an icon for liberal movements in Spain. Many military coups were attempted, and finally Col. Rafael del Riego's one succeeded and forced the King to accept the liberal constitution, which resulted in the Three Liberal Years (Trienio Liberal). The monarch not only did everything he could to obstruct the Government (vetoing nearly every law, for instance), but also asked many powers, including the Holy Alliance, to invade his own country and restore his absolutist powers. He finally received a French army (The Hundred Thousand Sons of St. Louis) which only met resistance in the liberal cities, but easily crushed the National Militia and forced many liberals to exile to, ironically, France. In his second absolutist period up to his death in 1833, Ferdinand VII was more cautious and did not try a full restoration of the Ancien Régime. When the monarchy was overthrown in 1873, the King of Spain was forced into exile. The Senate was abolished because of its royally appointed nature. A republic was proclaimed and the Congress of Deputies members started writing a Constitution, supposedly that of a federal republic, with the power of Parliament being nearly supreme (see parliamentary supremacy, although Spain did not use the Westminster system). However, due to numerous issues Spain was not poised to become a republic; after several crises the republic collapsed, and the monarchy was restored in 1874. The regime just after the First Republic is called the Restoration. It was formally a constitutional monarchy, with the monarch as a rubberstamp to the Cortes' acts but with some reserve powers, such as appointing and dismissing the Prime Minister and appointing senators for the new Senate, remade as an elected House. Soon after the Soviet revolution (1917), the Spanish political parties started polarizing, and the left-wing Communist Party (PCE) and Spanish Socialist Workers' Party (PSOE) blamed the Government for supposed election fraud in small towns (caciquismo), which was incorrectly supposed to have been wiped out in the 1900s by the failed regenerationist movement. In the meantime, spiralling violence started with the murders of many leaders by both sides. Deprived of those leaders, the regime entered a general crisis, with extreme police measures which led to a dictatorship (1921–1930) during which the Senate was again abolished. The dictatorship, now ruled by Admiral Aznar-Cabañas, called for local elections. The results were overwhelmingly favorable to the monarchist cause nationally, but most provincial capitals and other sizable cities sided heavily with the republicans. This was interpreted as a victory, as the rural results were under the always-present suspicion of caciquismo and other irregularities while the urban results were harder to influence. The King left Spain, and a Republic was declared on April 14, 1931. The Second Spanish Republic was established as a presidential republic, with an unicameral Parliament and a President of the Republic as the Head of State. Among his powers were the appointment and dismissal of the Prime Minister, either on the advice of Parliament or just having consulted it before, and a limited power to dissolve the Parliament and call for new elections. The first term was the constituent term charged with creating the new Constitution, with the ex-monarchist leader Niceto Alcalá Zamora as President of the Republic and the left-wing leader Manuel Azaña as Prime Minister. The election gave a majority in the Cortes and thus, the Government, to a coalition between Azaña's party and the PSOE. A remarkable deed is universal suffrage, allowing women to vote, a provision highly criticized by Socialist leader Indalecio Prieto, who said the Republic had been backstabbed. Also, for the second time in Spanish history, some regions were granted autonomous governments within the unitary state. Many on the extreme right rose up with General José Sanjurjo in 1932 against the Government's social policies, but the coup was quickly defeated. The elections for the second term were held in 1933 and won by the coalition between the Radical Party (center) and the Confederación Española de Derechas Autónomas (CEDA) (right). Initially, only the Radical Party entered the Government, with the parliamentary support of the CEDA. However, in the middle of the term, several corruption scandals (among them the Straperlo affair) sunk the Radical Party and the CEDA entered the Government in 1934. This led to uprisings by some leftist parties that were quickly suffocated. In one of them, the left wing government of Catalonia, which had been granted home rule, formally rebelled against the central government, denying its power. This provoked the dissolution of the Generalitat de Catalunya and the imprisonment of their leaders. The leftist minority in the Cortes then pressed Alcalá Zamora for a dissolution, arguing that the uprising were the consequence of social rejection of the right-wing government. The President, a former monarchist Minister wary of the authoritarism of the right, dissolved Parliament. The next election was held in 1936. It was hotly contested, with all parties converging into three coalitions: the leftist Popular Front, the right-winged National Front and a Centre coalition. In the end, the Popular Front won with a small edge in votes over the runner-up National Front, but achieved a solid majority due to the new electoral system introduced by the CEDA government hoping that they would get the edge in votes. The new Parliament then dismissed Alcalá-Zamora and installed Manuel Azaña in his place. During the third term, the extreme polarisation of the Spanish society was more evident than ever in Parliament, with confrontation reaching the level of death threats. The already bad political and social climate created by the long term left-right confrontation worsened, and many right-wing rebellions were started. Then, in 1936, the Army's failed coup degenerated into the Spanish Civil War, putting an end to the Second Republic. Attending to his words, Francisco Franco's intention was to replace the unstable party system with an "organic democracy" in which the people could participate directly in the nation's politics without any parties. From 1939 to 1942, the legislature of Spain worked essentially without constitution, with the 100 member National Council of the Falange (similar to the politburo of the Communist Party of the Soviet Union or the Grand Council of Fascism in Italy) replacing the General Assembly indefinitely. The Organic Law of 1942 established a unicameral legislature (called the "Cortes"), made up of more than 400 "representatives" (Spanish: procuradores, singular procurador). Members of the Cortes were not elected and exercised only symbolic power. It had no power over government spending, and the cabinet, appointed and dismissed by Franco alone, retained real legislative authority. In cases of "serious alterations" to the constitution, referendums were held in which only family heads (including widows) were allowed to vote. Virtually powerless city councils were appointed through similar procedures. Russian President Dmitry Medvedev signs the Book of Distinguished Guests at the Cortes Generales in Madrid on 3 March 2009. The Cortes are a bicameral parliament composed of a lower house (Congreso de los Diputados, congress of deputies) and an upper house (Senado, senate). Although they share legislative power, the Congress holds the power to ultimately override any decision of the Senate by a sufficient majority (usually an absolute majority or three-fifths majority). The Congress is composed of 350 deputies (but that figure may change in the future as the constitution establishes a maximum of 400 and a minimum of 300) directly elected by universal suffrage approximately every four years. The Senate is partly directly elected (four senators per province as a general rule) and partly appointed (by the legislative assemblies of the autonomous communities, one for each community and another one for every million inhabitants in their territory). 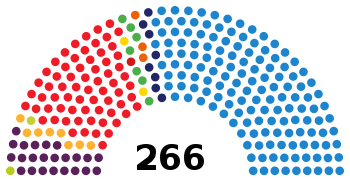 Although the Senate was conceived as a territorial upper house, it has been argued by nationalist parties and the Spanish Socialist Workers' Party that it does not accomplish such a task because 208 out of 266 members of the Senate are elected by popular vote in each province, and only 58 are representatives appointed by the regional legislatures of autonomous communities. Proposals to reform the Senate have been discussed for at least ten years as of November 2007. One of the main themes of reform is to move towards a higher level of federalization and make the Senate a thorough representation of autonomous communities instead of the current system, which tries to incorporate the interests of province and autonomous communities at the same time. ↑ The President of the Government is constitutionally nominated by the King, then once this nomination is confirmed by the Congress of Deputies, the monarch officially appoints the President of the Government. O’Callaghan, Joseph F. The Cortes of Castile-León, 1188–1350, 1989.